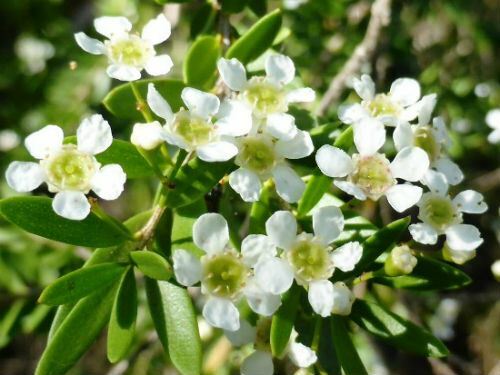 Sannantha crassa is a member of the Myrtaceae family and is a shrub that is said to reach a height of 2.5 metres. In our cold climate garden plants rarely exceed one metre in height. The branches are pendulous with aromatic, lanceolate to elliptical leaves. Flowers are usually carried in clusters of from seven to nine. They are white and about six millimetres in diameter. The flowering period extends from December to January. Many native insects are attracted to the flowers. Light pruning is appreciated after flowering. Sannantha crassa is a hardy medium shrub.Both growth habit and flowers are attractive features. Sannantha crassa occurs on the Northern Tablelands and North Coast of NSW. The species is usually found in rocky sites often on steep slopes and confined to the gorge country east of Armidale and south to Barrington Tops. One of the strongholds of S. crassa is Oxley Wild Rivers National Park, east of Armidale. Propagation is rapid from cuttings. S. crassa has had a botanical identity crisis. Firstly, the species was included in the Baeckea virgata complex then became Babingtonia crassa and finally (we hope) becoming S. crassa.